What a choice of song by former X Factor Judge (and Louis’ Judges’ Houses compadré) Tulisa. 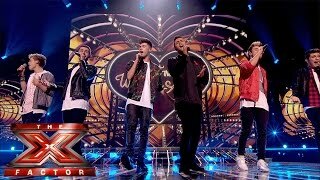 Allowing the boys to show off their great harmonies and brilliant chemistry, will that be what the Judges will be talking about tonight? Visit the official ITV X Factor site for pics, videos, news and backstage gossip. The X Factor's back with Simon, Cheryl, Mel B and Louis. The Yahoo Live cameras continue to travel far and wide to capture an even wider spectrum of musical talent, once a night, every night, for a year.